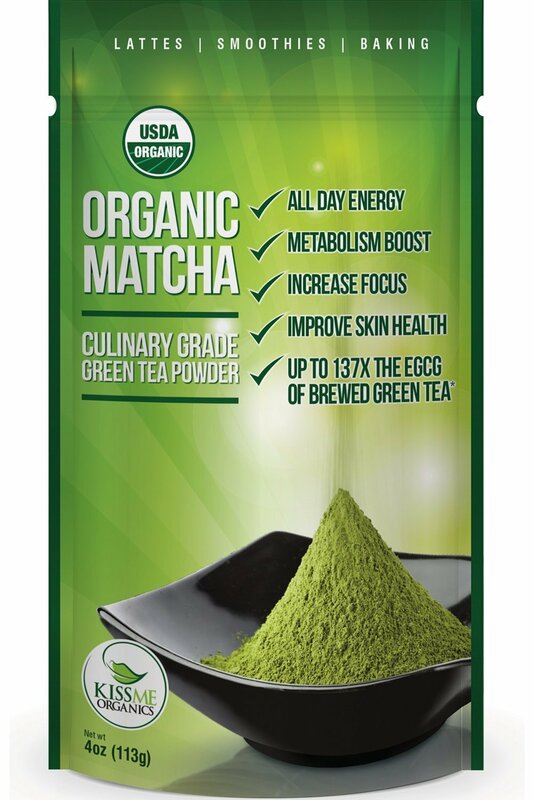 Home › Matcha Green Tea Powder - Powerful Antioxidant Japanese Organic Culinary Grad..
Matcha Green Tea Powder - Powerful Antioxidant Japanese Organic Culinary Grad..
100% certified organic Matcha increases energy and focus, lifting your vitality and concentration with the slow release of nutrients. Our organic Matcha will provide a steady energy boost throughout the day without the caffeine crash. Calorie-burning booster that helps maintain a healthy metabolism and naturally supports weightloss goals. Kiss Me Organic's organic Matcha powder is an ancient secret to beauty, health and longevity. Our top grade Matcha powder provides 4 to 6 hours of mild steady energy as it acts as both a stimulant and a relaxant, ideal for focusing on whatever the day throws your way. Consuming Matcha green tea can increase thermogenesis (the rate at which our body burns calories) by 30 to 50 %. Contains 137x the antioxidants of brewed green tea. BPA-FREE Packaging with resealable zipper pouch. Each package is nitrogen-flushed to ensure maximize freshness and potency. Our Culinary Grade Matcha is made from 100% certified organic ingredients. If for any reason you are not completely happy within 30-Days please return your Matcha for a no-questions-asked, 100% Money Back Guarantee. Yes, we are that serious about your satisfaction! :).